exporting and sharing loops and recordings. 1. Tap the "Rec" button in the top left corner of the main view to begin recording. 2. Tap "Rec" button again to end the recording. 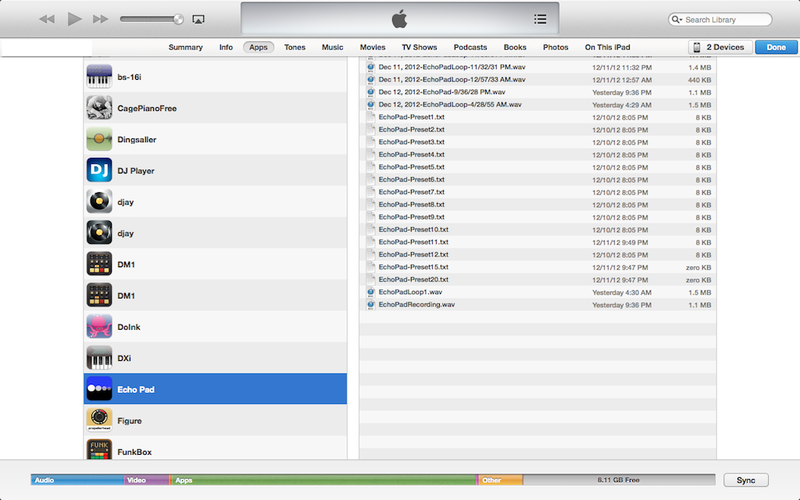 The recorded file is automatically saved in Echo Pad's documents folder in iTunes file sharing. 3. Open the "Export" menu to share the recording using AudioCopy or AudioShare. See the "Exporting" section below for more details. 1. Copy an audio file from another app using AudioCopy. 2. Once you have copied the audio file from another app, switch back to Echo Pad and tap the "Import" button. - "Paste audio to Scratch Looper 1" pastes the audio into Scratch Looper 1. The loop immediately begins playback in Scratch Looper 1. 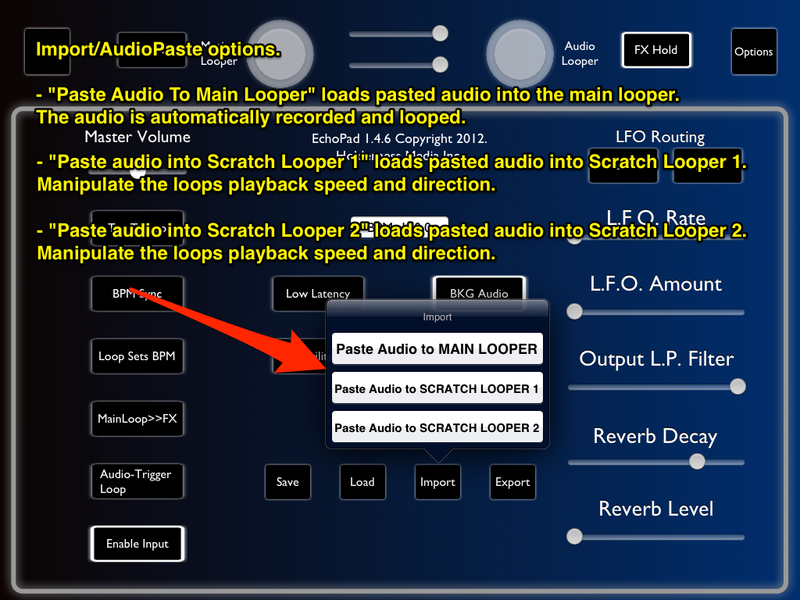 - "Paste audio to Scratch Looper 2" pastes the audio into Scratch Looper 1. 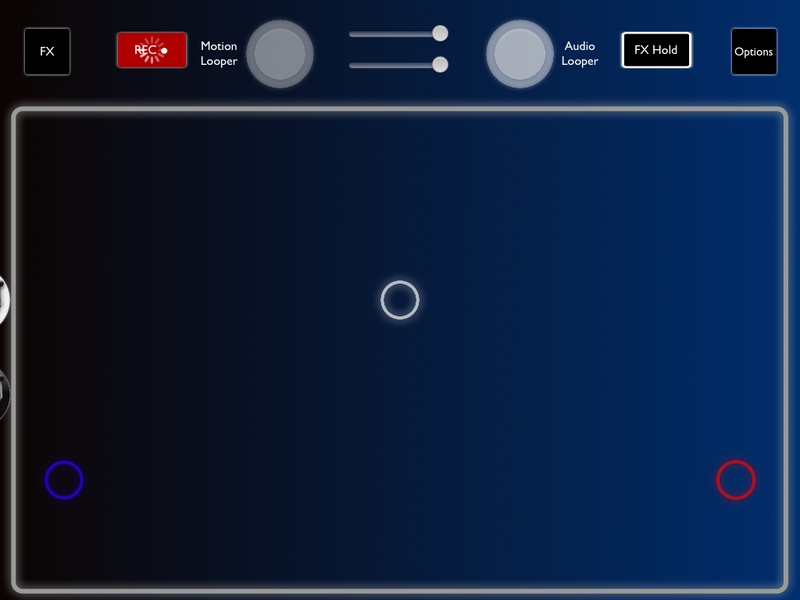 The loop immediately begins playback in Scratch Looper 2. 1. Once you have created a loop or recording that you would like to save, tap the "Export" button. 2. Choose one of the AudioCopy or AudioShare options to share your loops and recordings with other apps. - "Copy Main Loop to Pasteboard" - copies the most recent exported loop from the main sound on sound looper to the general pasteboard. - "Copy Scratch Loop 1 to Pasteboard" copies the current contents of Scratch Looper 1 to the general pasteboard. - "Copy Scratch Loop 2 to Pasteboard" copies the current contents of Scratch Looper 2 to the general pasteboard. - "Copy Recording to Pasteboard" copies the most recent recording to the general pasteboard. - "Export Main Loop to AudioShare" sends the most recent exported loop from the main sound on sound looper directly to the AudioShare app. 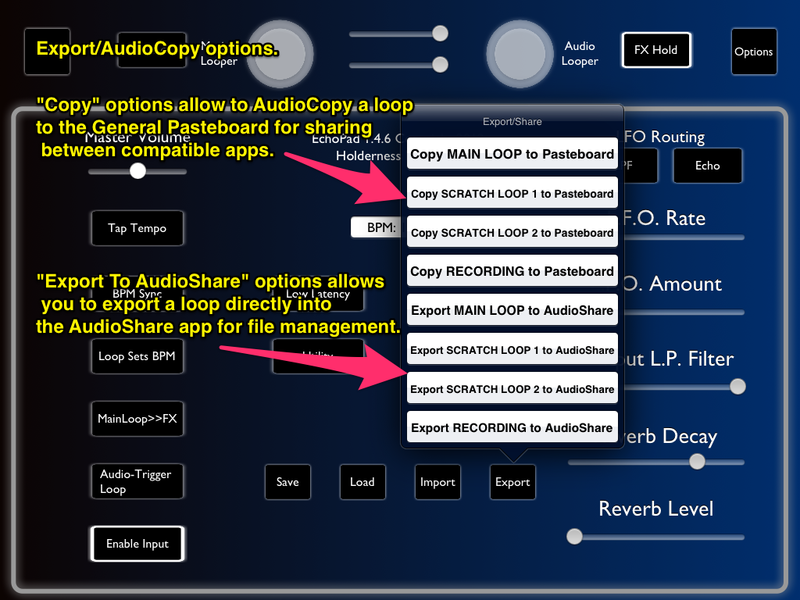 - "Export Scratch Loop 1 to AudioShare" exports the current contents of Scratch Looper 1 directly to the AudioShare app. - "Export Scratch Loop 2 to AudioShare" exports the current contents of Scratch Looper 2 directly to the AudioShare app. - "Export Recording to AudioShare" exports the most recent recording directly to the AudioShare app. ***AudioShare is an extremely useful app for managing your recordings and loops from different apps all in one place. It allows for normalizing audio files, renaming, organizing by folder, and more sharing options such as upload to Soundcloud, Dropbox, etc. If you don't own it already, download it on the Appstore here. In addition to AudioCopy and AudioShare options, all exported loops and recordings are automatically saved in Echo Pad's "Documents" folder in iTunes File Sharing. Connect your device to iTunes on your Mac/Pc, and navigate to Echo Pad in the connected device's Apps/File Sharing tab. You can then save the files to your computer, or delete them to free up space on your iOS device.